I was never a particularly big fan of colouring books as a child. I always found it a bit tedious having to colour in such large areas with a coloured pencil, and felt tip pens or water colours always bled through the paper ruining the drawing on the other side. I was not all that fond of painting either, as that generated too much mess to be tidied up afterwards. I could never get all the paint out of the brush bristles, a problem I still find today when doing DIY! 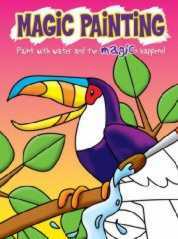 The answer to my prayers came in the form of the Magic Painting book. Thanks to the gift of chemical reactions, these books allowed you to colour in images using only a paint brush and some water. A special invisible substance was printed onto the drawings which when water was applied would mysteriously change colour in front of your very eyes. Using a paintbrush was much faster than colouring pencils, and the pages of these books were slightly thicker so the water didn’t tend to soak through the paper very much either. In order to indicate which areas of the drawing were specially coated the pictures were often filled with different repeating patterns that indicated which colour would appear when you painted it. Obviously any choice of what colour to make the drawing had been taken from you, but half of the fun was in trying to predict what colour would appear when you applied some moisture. This entry is filed under Books and Magazines	and was posted on July 10th, 2008. You can follow any responses to this entry through the RSS 2.0 feed. You can leave a response, or trackback from your own site.